Let’s Ask the Angels! 08/02 by Lets Ask the Angels | Spirituality Podcasts. A powerful week of week of being deeply connected especially by being aware our breath as it accesses us to our deeper consciousness. 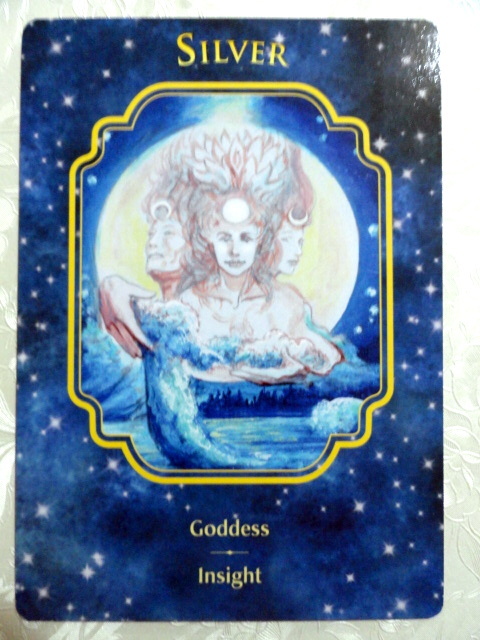 Also our ability to tap into our insightful and goddess side (creative, receptive) is strong. We can easily move forward, sharing our ideas and meeting new people. In all three cards there is water which symbolizes our emotions and creativity. Sunrise, sunset, night and day are all depicted. You find your power in your breath and being conscious of your breathing. You connect to the Divine and Universe by being present to your breath. You may take a yoga class, learn about pranayama or breathing exercises. You can connect to your deep inner wisdom at this time. Be present and aware of what stage of life you are in. Your power in speaking in public is available to you. Prosperity is coming to you at this time. A week to take action. Your claircognizance or ability to receive messages is especially strong if you spend time near the water. 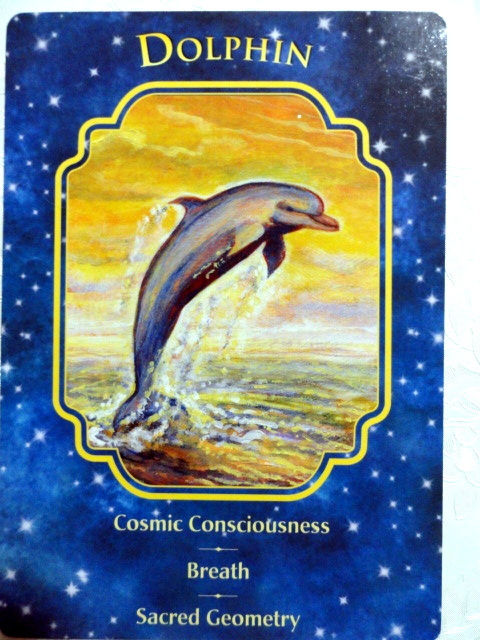 Monday, Tuesday: DOLPHIN-Cosmic consciousness, Breath, Scared Geometry. The dolphin card reminds us to breathe. By being connected to our breath regularly throughout the day we stay centered and can expand our awareness. Conscious breathing can relieve stress and keep us focused. This card also asks us to examine our connection with sacred geometry or cosmic patterns. These occur naturally in nature or we can create them with crystal grids to connect with cosmic consciousness. We are being called to attune with its sacred shapes. Geometric shapes you see in nature such as of leaf and floral patterns, stars, circles, pyramids, and the star of David shape or isocohedrons (Buckminster Fuller’s geodesic dome). This card can also mean using your breathe work to connect with your ancient primordial origins and the universe. It can be helpful to tap into the sounds of the ocean and or listening to oceanic music. Look into Kundalini yoga and learn about manifestation exercises using your breath and sacred sounds including mantras. Incorporate sacred geometric shapes into your daily life or ritual. You can play with these shapes by painting, drawing, or meditating upon them to awaken your innate creative powers and to open pathways into new dimensions. Wednesday, Thursday: SILVER-Goddess, Insight. This card indicates your magical powerful mysterious side is presencing itself. Your deep inner wisdom will be more available. It’s a powerful time to seek answers within. Silver is the symbol of the goddess and the Divine feminine, the moon, speech and public speaking, insights, perseverance, and patience. The goddess is connected to the Divine Source. She represents three aspects, the maiden, mother, and the wise woman. This card asks you to acknowledge which stage of life you are in and celebrate it. Pay attention to the phases and cycles of the moon as they connect with goddess energy and can synchronize with your own personal rhythm. Archangels Haniel, Gabriel and Jophiel are associated with this card. This is a very good time to take your work to the public. Your present project may take a birthing period of nine months to complete. Open yourself up to the abundance that is flowing at this time. By honoring your phase in life you can take responsibility for your actions and balance your emotional and logical sides for creating the best results. Friday, Saturday, Sunday: SUMMER-Taking action, Fruition, Intellect. 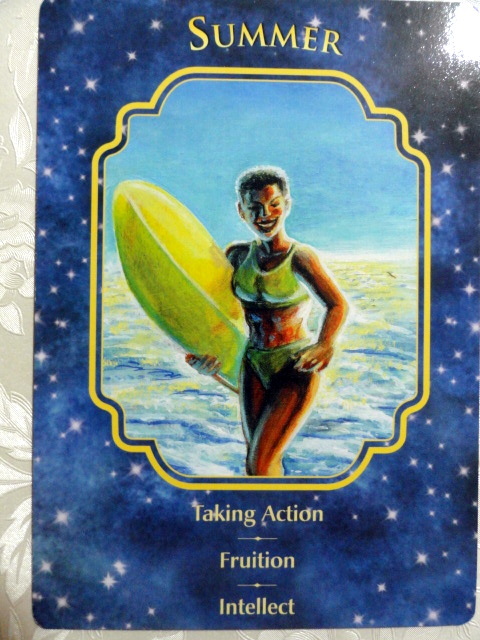 With this card you are being called to act without hesitation or delay. Take a moment to determine which actions you will take. Although you will face some obstacles not to worry as new breakthroughs for personal growth are available. Here we are in summer also so it’s perfect, that this is a moment when your goals or desires will come to fruition. You can expect that your projects, relationships, and commitments will come together. Also, the Archangels Uriel and Ariel are connected to this card. This is a time of high energy so stay grounded. As mentioned being connected to your breath and spending time outside in nature will help. The mind is very active at this time with your ability of claircognizance strong. (receiving messages from thoughts) By focusing on your maiden/warrior self you can funnel your self confidence into a powerful and positive force. It’s a great time to get out and meet new people as being social also opens you up to growth.